"The City Scape Headpiece is a tilted pagoda shape made of colored pagalina straw. After 9/11, I designed this piece as tribute to the resilience of NYC. New Yorkers united to keep the city's momentum going. Towers and shops reach to the sky, green trees represent New York City's peaceful parks, and the black bind road is complete with your NYC yellow cab." A portion of proceeds for this style will be donated to Tuesday's Children. 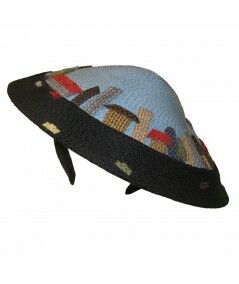 The City Scape Headpiece is part of "HATS, An Anthology by Stephen Jones" Main Exhibit. It has traveled with the exhibit to Brisbane, Istanbul and New York City. It will open this September at the Peabody Essex Museum.